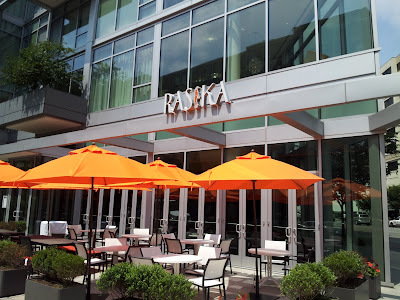 The vibe was very positive as I entered the new Rasika West End on 22nd and M to meet a friend Rozanne Weissman a award winning communicator and connector in the DC area. The first person I met was a well dressed gentleman on the phone, who opened the door for me and flashed a welcome smile. He later introduced himself to me as Ashok Bajaj the savvy DC restaurateur who opened Bombay Club 20 years ago close to the White House. I was early and as I took a seat at the bar, a glass of water appeared magically. Every one who entered was greeted with a passion and all employees made eye contact with customers and greeted them pleasantly almost like they were trained by the same trainer as the Ritz Carlton. The standard of service and the orchestration of the restaurant really impressed me. Water glasses were magically filled. You just had to look like you wanted to ask a question and someone would appear to answer your question. 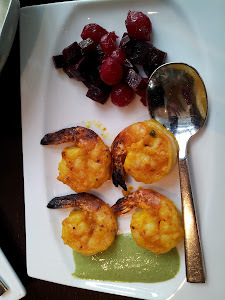 Food was nice, we decided to order 3 appetizers : a Mango Shrimp, Tawa Fish , Palak chaat accompanied by a Chive and Olive Nan and a Malabari Paratha. 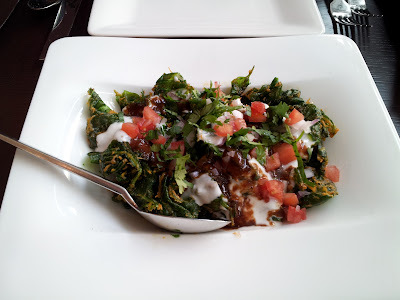 The entrée Kolhapuri chicken with rice was excellent. I would rate this restaurant very high not only on the food experience but for being on of the best examples of restaurant serving standards. The operations run like an orchestra with General Manager Atul managing this operation.I was impressed by Ashok Bajaj being at the restaurant frontlines himself. I would definitely recommend a visit. I parked on the street at a 2 hour parking spot that cost me about $4. 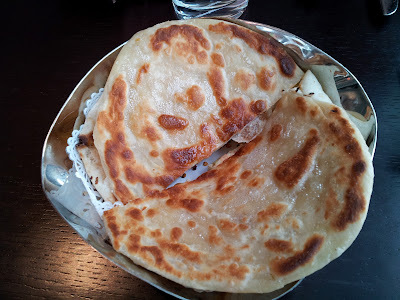 The Ritz Carlton is right opposite the Rasika – West End.